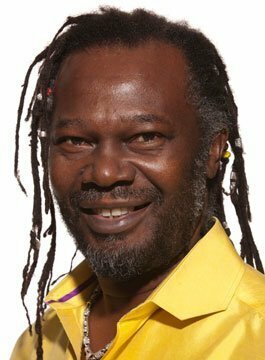 Levi Roots is the Rastafarian musician, chef and entrepreneur behind the successful Reggae Reggae Sauce brand. In 2007, with the help of Peter Jones, Levi secured an exclusive contract with Sainsbury’s which saw his ‘Reggae Reggae Sauce’ stocked in stores across Britain. Subsequently, the sauce was the chain’s fastest ever selling product. Levi had been producing the sauce from his home kitchen with the help of his family and selling it via small outlets in London. Levi’s secret recipe was inspired by his grandmother Miriam Small who taught him how to cook from a young age in Jamaica. Levi had the recipe in his head for years but didn’t start producing it until 1991 at the Notting Hill Carnival at what he calls the ‘Rastaraunt’ – a regular feature at the Carnival for over 20 years. In 2007, Levi appeared on BBC 2’s Dragons’ Den. Levi entered the Den performing his ‘Reggae Reggae Sauce’ song, charming the Dragons with his infectious personality. Following many questions, Levi eventually secured investment by Peter Jones and Richard Farleigh jointly investing £50,000.00 for a return share of 40 per cent of his company. Reggae Reggae Sauce is a delightful mix of barbecue and jerk sauce which took Britain by storm. The rapid popularity of ‘Reggae Reggae Sauce’ has seen an expansion of the brand, to include a wide range of sauces and products. Levi’s first cookery book, Reggae Reggae Cookbook was published in June 2008 and continues to sell exceptionally well. His second book, Caribbean Food Made Easy (2009), was accompanied by a BBC2 series. Consequently, more books have followed including, Food For Friends, Spice it Up, Sweet, and Grill it with Levi. Levi has also written a business book ‘You Can Get It If You Really Want’ which charts his success and provides tips on how to get ahead in business. Levi has also launched an app called Levi Roots’ Sunshine Food. His late entry into the culinary field came because of commitments to music. Levi has worked in the music industry for over 30 years as a Reggae singer. As a singer, songwriter, producer and promoter, Levi has sung ‘Happy Birthday’ to Nelson Mandela, worked with James Brown, Maxi Priest and Sly & Robbie, and even played football regularly with friend Bob Marley. Levi released his critically acclaimed album “Free Your Mind” in 1998. As a result, Levi was nominated for a MOBO Award. A tour then followed throughout Europe, Asia, Africa, USA and the West Indies. Levi is a regular face on TV and in newspapers, magazines and cookery pieces. He is also an incredibly charismatic motivational speaker. The philanthropist in Levi sees him giving back to the community and the young people in the UK today by visiting hundreds of schools, universities and prisons every year as part of his School of Life Tour. Levi is also a proud ambassador of The Prince’s Trust.